This Thursday I will be driving to Cincinnati, OH for the LN event at Popular Woodworking. Daed Toolworks, Czech Edge, Glen-Drake Tools, George Walker, SAPFM, and Jeff Miller will all be presenting along with Lie Nielsen and the staff of Popular Woodworking. Here is a better write up than I will attempt. All I will say is that I definitely do not have the time to make this trip. I forced it in my schedule. This show, with all the other presenters, is one I really want to attend. I am going as a fan of the magazine but telling my wife that it's just one of those sacrifices one needs to make for a new business. I won't be eating at White Castle this time. I will not make that sacrifice twice. Profiles greater than 60 degrees, etc. When I was just getting interested in hollows and rounds I read an old Fine Woodworking article that shows the exact opposite of what I teach. The author shows that a round plane is started on a chamfer and a hollow starts on an arris of a rabbet. 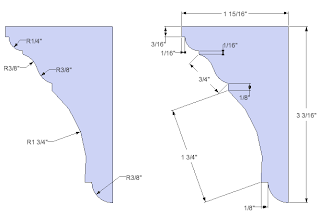 Chris Schwarz demonstrated this second method for cutting cavettos (coves) on his blog yesterday. Take a look because it's fun watching people work and because there is more than one way to get from A to B. Chris learned to stick moldings this way and has stated that he has much more success starting on a chamfer than with a rabbet, as I illustrate. You can't argue with success in 5 minutes and that's all that matters. To the point: in the comment section I had a brief exchange with a woodworker that pointed out a few mistakes that I have made with my illustrations on my blog in the past. I know I've done it, but always thought that my writing would supercede my poor illustrations. (note: I look at woodworking magazines more than I read them so I apologize for assuming the opposite of you.) In the picture frame in this link the chamfers I used were smaller than what I illustrated, but at the same angle. But let's first start with a simple 60. 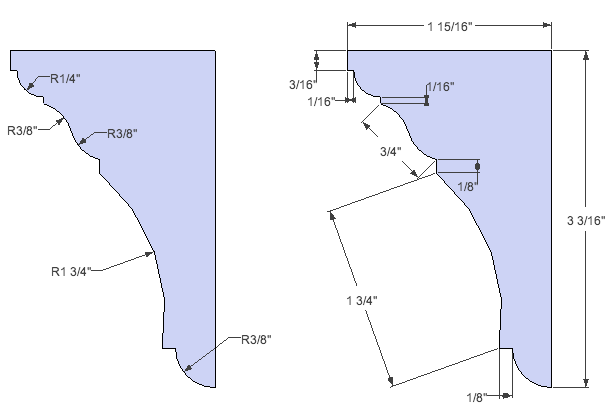 When cutting a 60 degree profile the inset corner of the rabbet created can fall nearly upon the finished profile. The reason for this is because the plane will never get rotated. It starts and finishes on the same angle. As the profile progresses the plane will sit in its own profile at all times. Last week we laid out and executed a large bracket ogee foot for a PA secretary. Let's take a quick look at the crown.